A theme I see in the knitting patterns that I recently added to my Ravelry store is using stripes to add color. Here are three designs that use stripes. They many not all be the most obvious striping techniques. All are easy and fun. 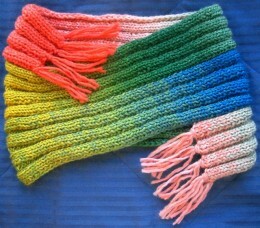 First, a group of cowls to knit from Schoppel Gradient, a slow color-changing yarn. 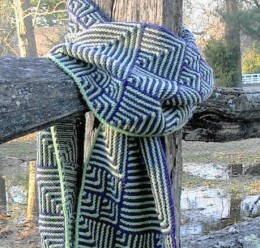 By knitting a narrow band and using a join-as-you-go method, the narrow band spirals to form the cowl. The color stripes happen as the yarn changes its mind and one color is attaching to a different color. So easy! The yarn does all the work for you. With a generous 284 yards, just one skein of Gradient makes a cowl. One-skein projects are extra satisfying, aren’t they? This pattern is called, appropriately, Corkscrew Cowls. Cowls plural. The pattern includes options for three different textures for the cowl–plus choices for embellishing the cowl. The multi-colored version shown here has fringe; I love the way fringe of one color spills over onto other colors while wearing the cowl. Another option is lapping two ends of the spiral over one another and fastening with a decorative button. Modular knitting is one of the easiest ways to add stripes to your knitting. In the Miter Mix Muffler, there are two colors, and only one color is used in any particular row. That’s easy right away. These miters are knit in various sizes to make the knitting and the visual effect both more interesting. The yarn is Miss Babs Yowza–Whatta Skein! The colors are Violets and Spring Lettuce. I chose strongly contrasting colors for the sample; closely related colors or one solid and one variegated could both be combined in fascinating ways. Muffler rather than scarf? To me, a muffler is reliably warm, while a scarf can be light and filmy and worn for reasons other than warmth. In garter stitch, this is definitely a muffler, first tested in Chicago where winters are renowned for wind and cold. If it kept me warm in Chicago, think what it can do in another cold spot. 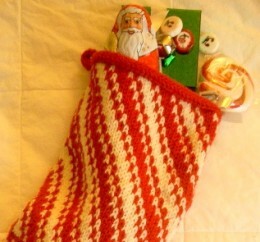 The Peppermint Stocking uses a traditional stranded technique to create stripes in red and white. Knitting a Christmas stocking like this is one of the easiest ways to practice stranded knitting for colorwork. More ideas from another post as well. Yipes! Stripes! So many exciting possibilities! This entry was posted in knitting, pattern, technique and tagged christmas stocking, colorwork, cowl, modular, one-skein, scarf. Bookmark the permalink.